Red-naped Sapsucker - this poor little tree hardly had a square inch without a sap well on it. I'm surprised it looks like a perfectly healthy tree. Some friends of ours have a family cabin in Round Valley, Idaho. Round Valley is just north of Smiths Ferry and just south of Cascade. I had never been birding in this area before, but it certainly merits the title of an Idaho Birding Hotspot. Jason Talbot, his wife Colleen, and their seven cute little girls invited my family to spend a long weekend with them with all kinds of side adventures which will be featured on the next couple of posts. Jason was a birder as a kid and hanging around me has reawakened the monster in him. 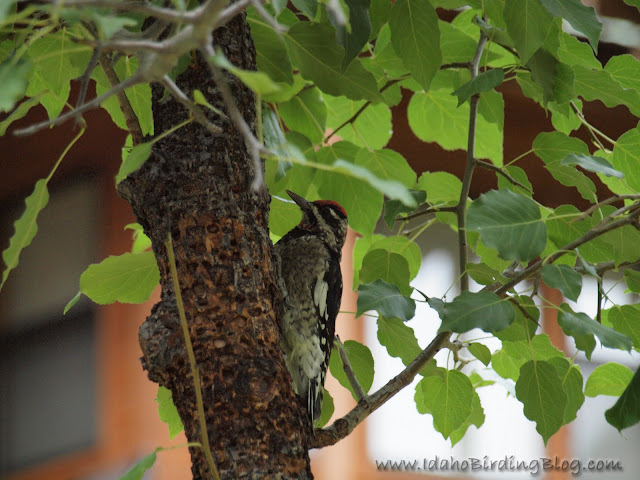 The birding around their cabin was spectacular! The first night there, we did a little owling by playing a variety of owl calls using Stokes Field Guide to Bird Songs. Within a few minutes, we had a Northern Saw-whet Owl calling back to us. It approached to with 20 feet of the cabin deck, but we never did see it. Mountain Chickadee - notice the white eyebrow? That is the quickest and easiest way to i.d. this fun chickadee. My quest was to see my first Pileated Woodpecker which Jason had recently seen in the yard of the cabin. That first morning we heard the infrequent heavy drumming along with the distinct call of the Pileated Woodpecker. We did our best to follow the sound through the woods until we came to the no trespassing sign on property line. We knew we were close. If we could just see through that one clump of trees...then the neighbors two dogs detected us and starting barking up a storm. The barking sent one Pileated Woodpecker flying up out of the trees, offering me my only positive though unsatisfying glimpse at my target bird. We did not hear or see Pileateds the rest of the trip. The other birds were so wonderful that I did not leave disappointed. 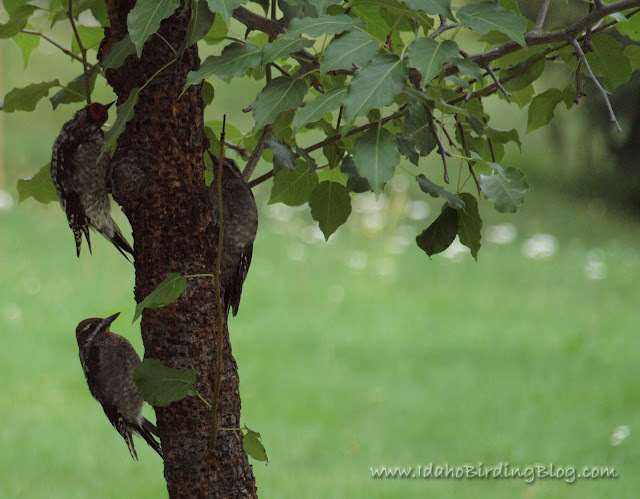 Three young Red-naped Sapsuckers in the one little tree. Saturday morning was very birdy. I added Least Flycatcher to my life list. There were several warblers moving through the area, Lincoln's Sparrows and even Ruffed Grouse. Saturday evening however was very light on bird numbers, but still yielded one of those spectacular birding moments that I'll never forget. We walked along the dirt road loop that encompassed three properties including the Talbot's cabin. At the far edge of the loop we watched a couple Swainson's Thrushes among the pines and aspens at the lower end of a lush ravine. 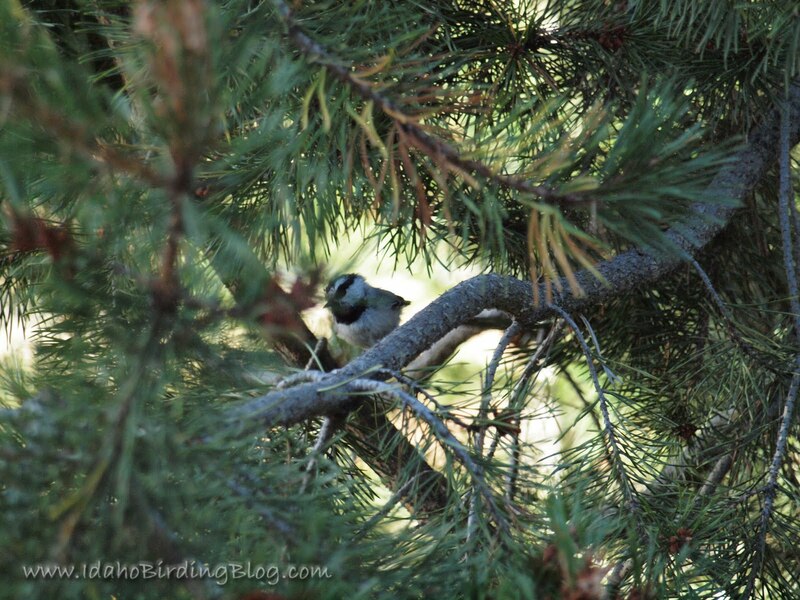 Suddenly, a bird flew across the dirt road twenty yards ahead of us and perched on a pine bough right at eye level. I put my binoculars on it and stammered out a loud whisper "V - Va - Va - VARIED THRUSH!" "No way! You're kidding, right? Where is it?" Jason questioned thinking I was just playing a mean joke. The Varied Thrush was at the top of Jason's list for birds he definitely wanted to see. I had had two previous in-flight sightings of this really awesome bird, but nothing even 1/100th as amazing as what I was now seeing. 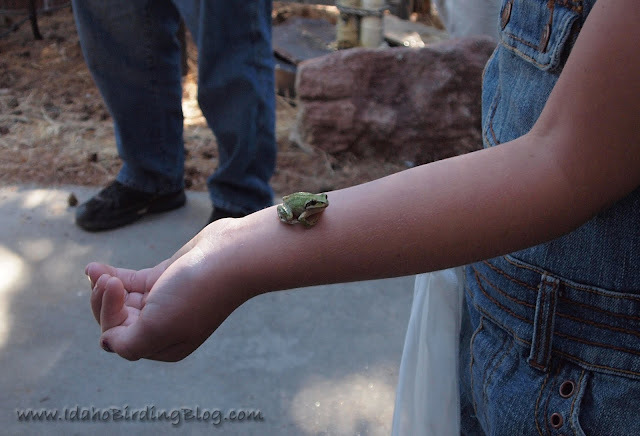 I really wanted Jason to see it before it flew off. I struggled to find landmarks by which to guide him to it. Those frustrating seconds felt like eternity, but finally Jason located the Varied Thrush in his optics. The bird was very obliging and remained perched for well over a minute. We enjoyed long looks and burned the image into hearts and minds. It was in perfect textbook plumage, just like the cover of the western Sibley guide. I didn't have my camera on me, which I kind of lament, but then again, perhaps the moment was to sacred to photograph anyway (plus the lighting was terrible). A day later, both Jason and I are still enjoying the afterglow of such a great sighting. Having fun on the huge swing. That first drop makes your stomach come up through your throat. Me with my youngest Claire. 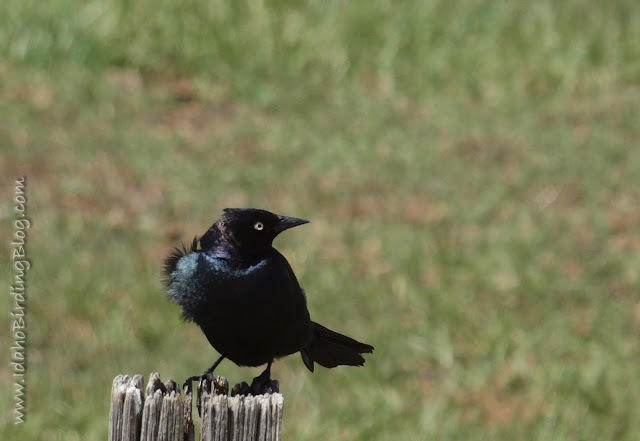 A male Brewer's Blackbird buffeted by a breeze. As a Mormon boy, I delighted in the pioneer story of the Miracle of the Gulls. In 1848, not even a full year after the vanguard group of pioneers first arrived in the Salt Lake valley, crickets came in hordes devouring the much depended upon crops. The pioneers used divers methods to kill and discourage the crickets, but the onslaught was so great that they could only put their trust in God to deliver them from this plague. Gulls came in great numbers and began gorging themselves on the crickets. When they had filled themselves, they regurgitated and continued eating until finally eliminating the crickets. Thus the California Gull became the state bird of Utah and those nasty crickets are now known as "Mormon Crickets". Well, we've been experiencing our own plague of two-striped grasshoppers this year. Would I be witness to another avian miracle?! On the heels of the grasshoppers have come great flocks of Brewer's Blackbirds gorging themselves on those pesky hoppers. It is really funny to watch the Brewer's flitting about chasing after grasshoppers from their perch on the ground. Their aerial dexterity is impressive, though not always successful and it's comical to watch each attempt at capture. 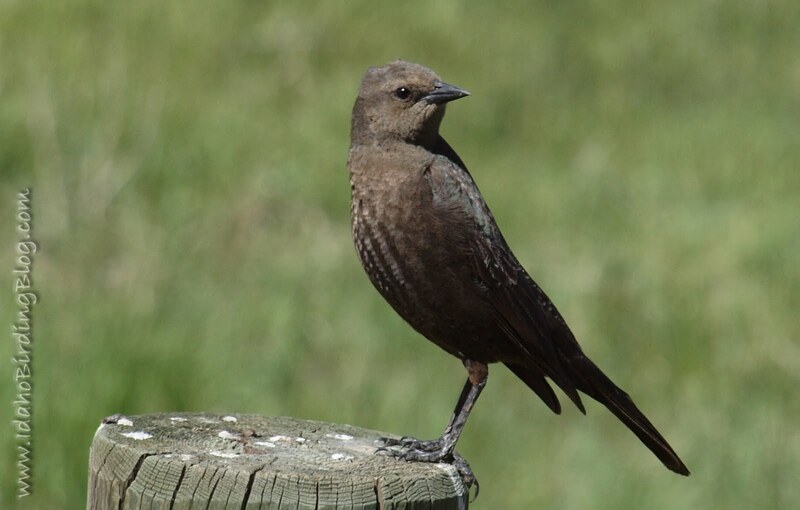 Brewer's Blackbirds are persistent and not too many grasshoppers, once targeted, escape to survive. Observing the Brewer's Blackbird's method of dispatching a grasshopper is most interesting. I must admit that the torturous episodes vicariously gratify my desire for revenge on these locusts. Permit me to expound: The grasshopper is snatched in the bill, wounded a bit, then intentionally dropped. It is then grasped in the bill again, but by one of the big powerful hopping legs. At this point it is shaken and flung about until the body detaches from the leg. 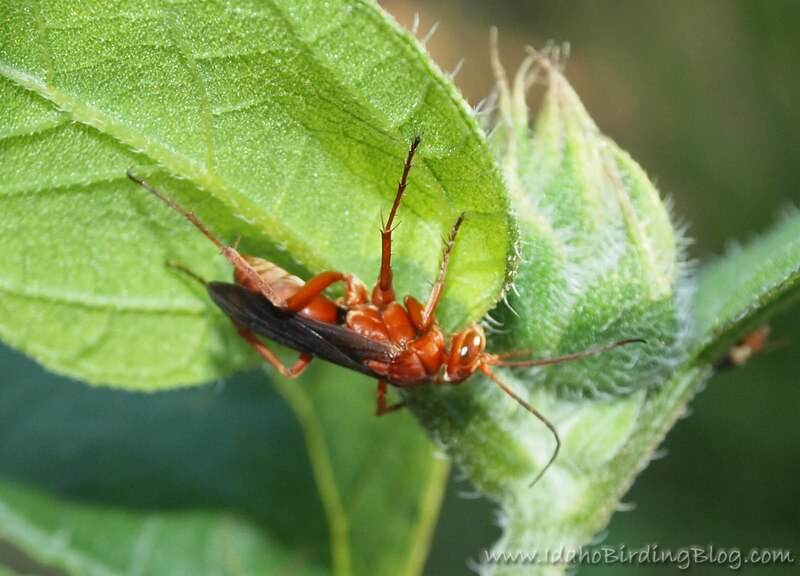 The fallen hopper is then picked up again by the other large leg and the whipping about is repeated until the hopping appendages are completely removed. 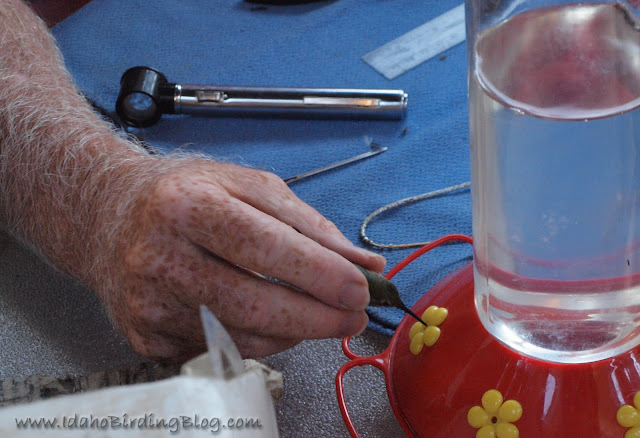 At this point the birds will sometimes mash them up a bit more on a rock and then swallow them. You see, getting those large legs off and a little lubrication from spilled guts helps them slide down the gullet without resistance. Awesome!!! 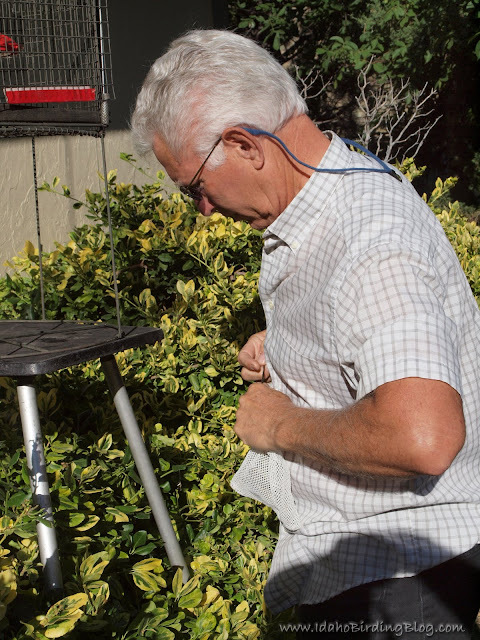 Now if only my miracle had come two weeks earlier my backyard would still have at least a few living plants. When we first moved back to Idaho three and a half years ago, Eurasian Collared-Doves were just starting to be noticed in the Treasure Valley area of Idaho. I lived in Star, Idaho at the time and about 8 miles west was a reliable spot to see them in Middleton at the Oregon Trail Church. About a year and a half ago, we moved to Avimor, in the foothills north of Eagle and Boise. I've been wondering how soon I'd see Eurasian Collared-Doves at Avimor. Well...they are very close now. For the last couple of months I've been seeing a couple of them on Beacon Light Rd, close to Highway 55. That means they are now only about 5 miles away. I had previously blogged about Eurasion Collared-Dove expansion in North America, but recent IBLE chatter got me wondering about how they have expanded across Idaho. Here is an animated map that I made using eBird reported sightings. The animated map below is focusing only the the Treasure Valley area of Idaho, specifically Canyon and Ada Counties. Watch for my E. Collared-Dove sighting north of Eagle to pop up on the 2010 map. Some of this data may be slightly skewed due to increased numbers of eBird users in the last few years, but based on anecdotal evidence, the expansion of Eurasian-collared Doves pretty well matches what the animated maps are showing us. Many birders, and even old-time farmers, express hatred and frustration at these new birds to our area. I'm not sure why they hate them? From what I can tell they aren't displacing any other species of birds, as do European Starlings. Perhaps they can be a nuisance like Rock Pigeons, but they seem to act more like Mourning Doves. If the reason for disliking them is that 'they shouldn't be here', well, neither should all the really cool vagrants that we get so excited about. Looks like we probably have more Eurasian Collared-Doves and more European Starlings than Europe does. Maybe its time to drop the geography from their names on the official bird lists in North America. For what its worth...I think Collared-Doves are neat looking. They are larger than Mourning Doves, lighter in color. They also have the big white tail feathers which are fan-shaped in flight rather than wedge shaped. That black partial collar also distinguishes them from other dove species. 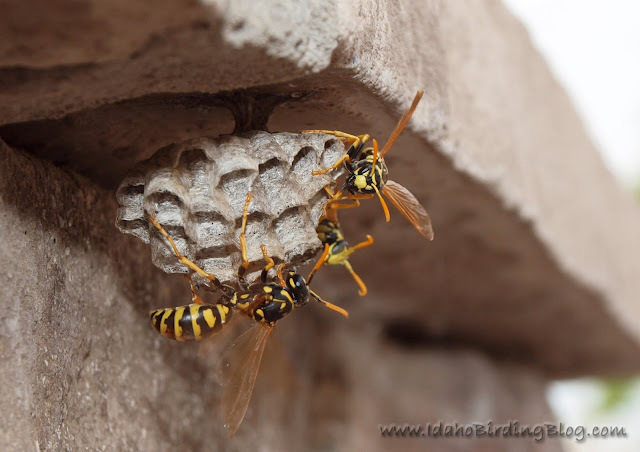 Anyway...we still may have a few more months or years before they are present across the whole Treasure Valley. I expect that they'll be at Avimor by next Spring. 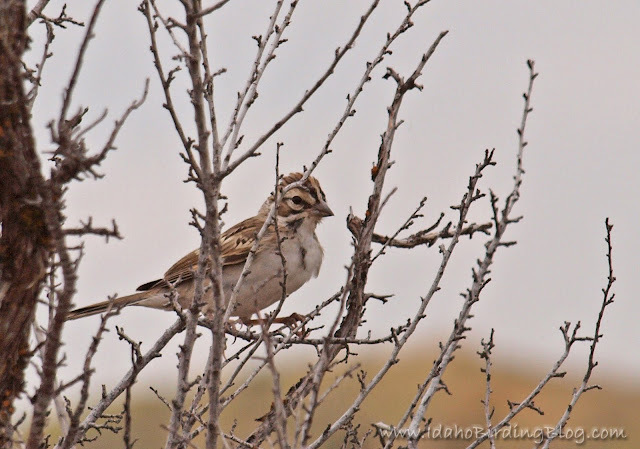 Idaho Camera Birding Photo Competition - This November! 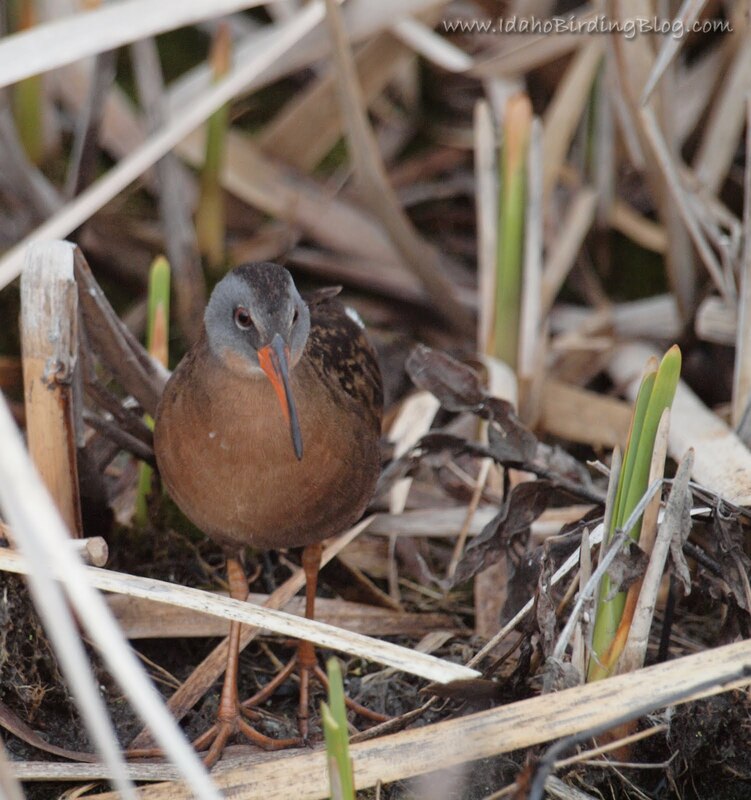 I just wanted to give a quick notice to all you Idaho bird photographers, including guests to Idaho, that round two of the Idaho Camera Birding Photo Competition begins soon. I invite you to take the next couple of months to get out there across scenic Idaho to enjoy nature and take pictures of birds! Also, I am seeking out nice prizes for the runner's up, so hopefully more incentive to share your bird photography with us. Please check out the Photo Competition Page of this website for the details and to see last May's results and judges comments to help you capture a winning image. A small change from the last round is a limit two photos per entrant, rather than three. Photos will be due on the Friday, November 26th, 2010 - the day after Thanksgiving. 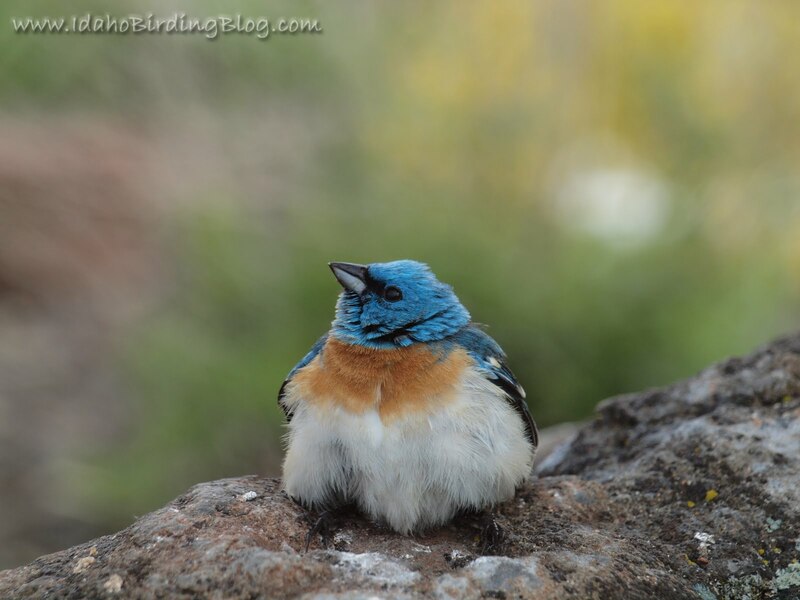 We had a late snow that caused all kinds of lethargy among Lazuli Buntings and Western Tanagers making this a very lucky close-up. The poor little guy was so cold! 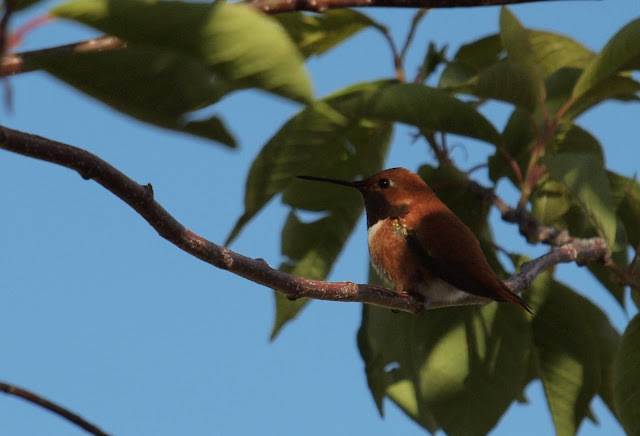 Rufous Hummingbird (male) chillin' in the shade earlier this Spring in my backyard. 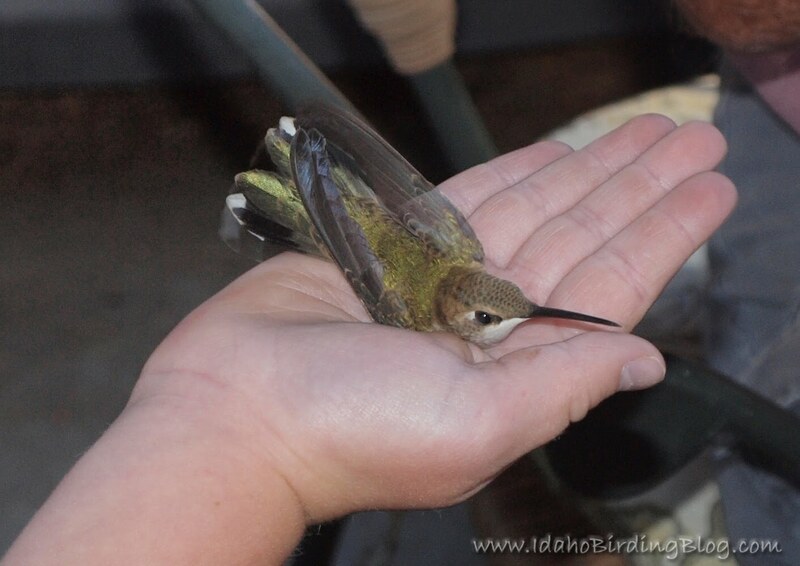 About a week ago I posted about the Hummingbird Banding in Pearl, Idaho. 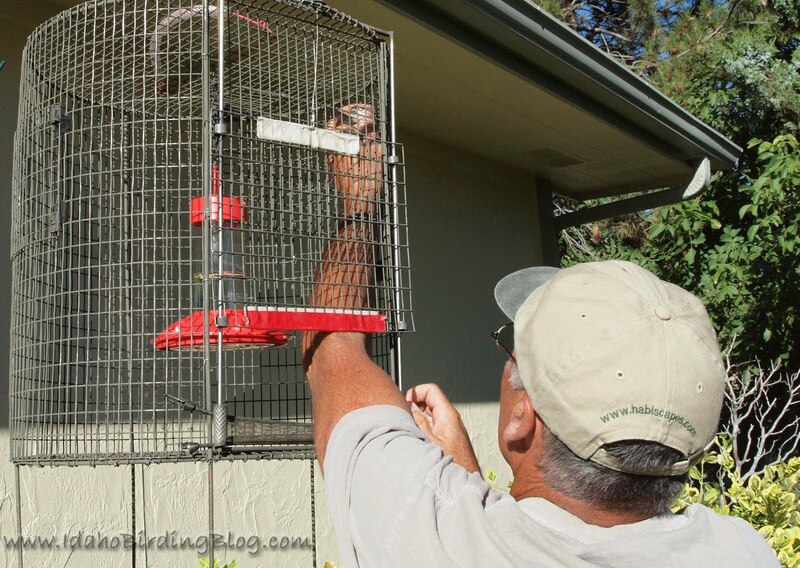 One of the hummers captured was a recapture, a bird that had been previously banded! Recapturing is the whole point of banding, right? Scientists can learn a lot by recapturing banded birds...like changes in plumage, weight, fat stores, migration routes, etc. Fred Bassett informs me that the recaptured hummer was an adult female Black-chinned Hummingbird that was originally banded in October 2009 in Slidell, Louisiana. 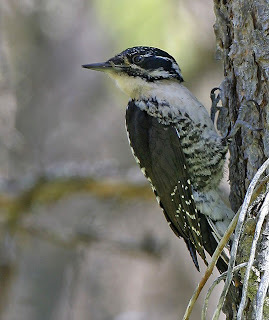 I didn't even know they had BC's in the south, but Fred says he averages 30 or so BC Hummers in the Southern states during the winter and eBird reports confirm it. If the hummer followed the most direct route on the highways, which they don't, that would have been over 2,200 miles. Now think about this...this little lady BC Hummer was probably migrating south from somewhere north of Idaho, so it had probably traveled much further. How cool is that!? 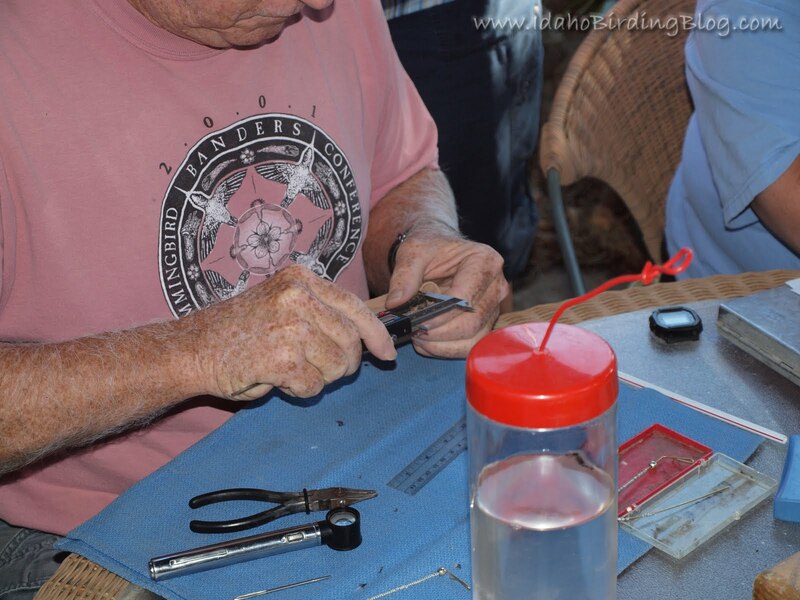 Fred Bassett sharing his knowledge of hummingbirds with loads of curious adults and kids. 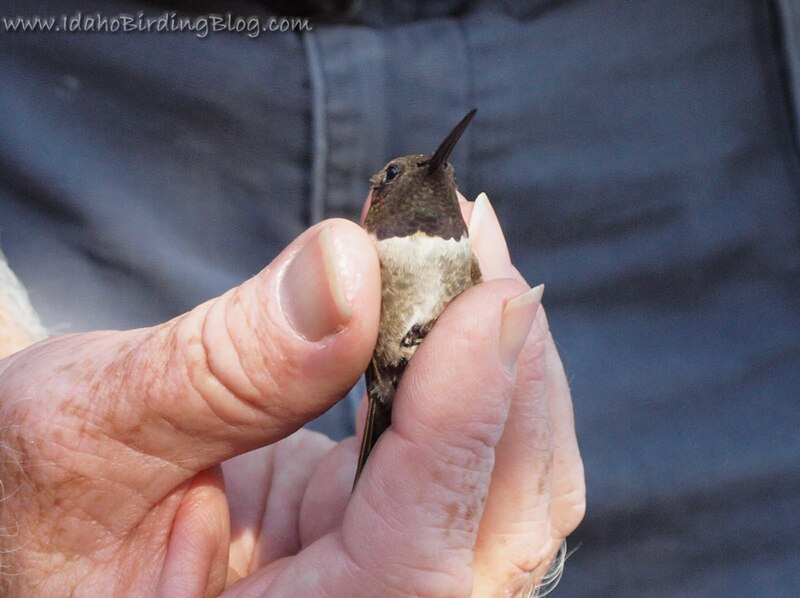 Another exciting recent recapture story has been making the circuit of birder's email inboxes...A sub-bander of Fred Bassett, Fred Dietrich, banded a female Rufous Hummingbird in Tallahassee, Florida on 13 January 2010. It was recaptured by Kate McLaughlin on 28 June 2010 in Chenega Bay, Alaska! 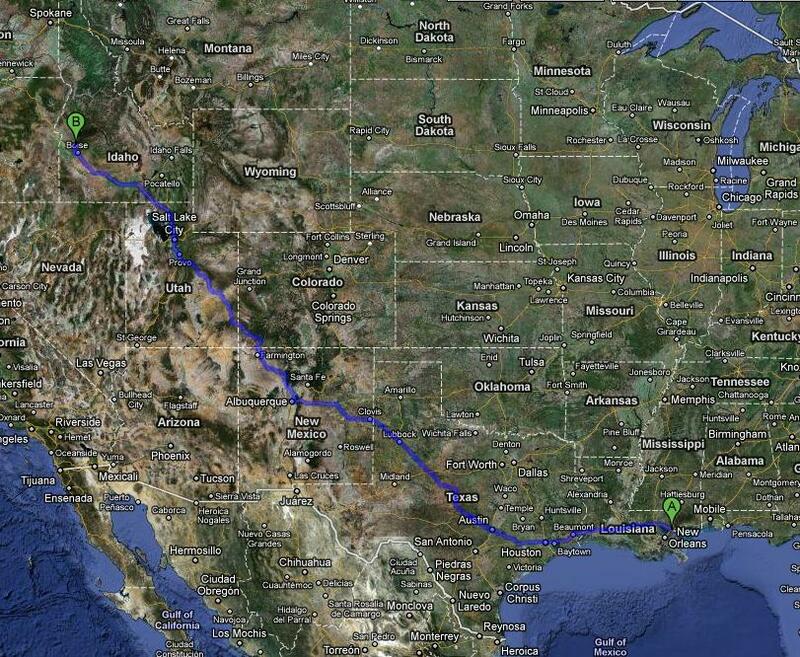 That is a migration of at least 3,500 miles and now holds the record for the longest documented hummingbird migration. Amazing! To see pictures of this record holder, check out Fred D's photo site here. 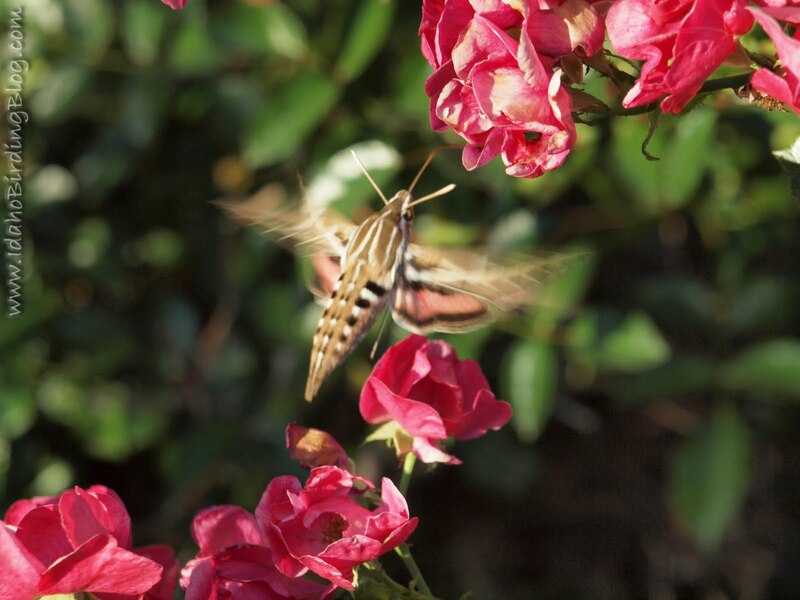 Growing up here in Idaho we always just called these "hummingbird moths" as they zip around from flower to flower with rapid wing beats like a hummingbird. The above shot is completely unedited, not even cropped. I like how the wild roses pass through the picture framing the bottom left and upper right corners with the Sphinx Moth right in the middle. Two-stripped Grasshopper on Wooly Mullein plant. These grasshoppers are the bane of my existence right now as they have destroyed my yard. 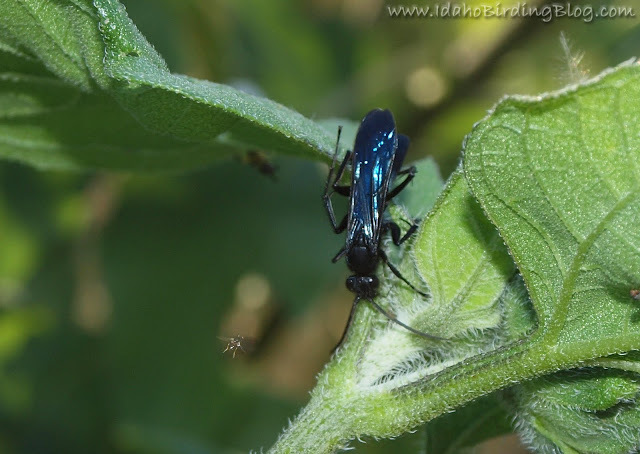 Great Black Wasp and some other little fly. 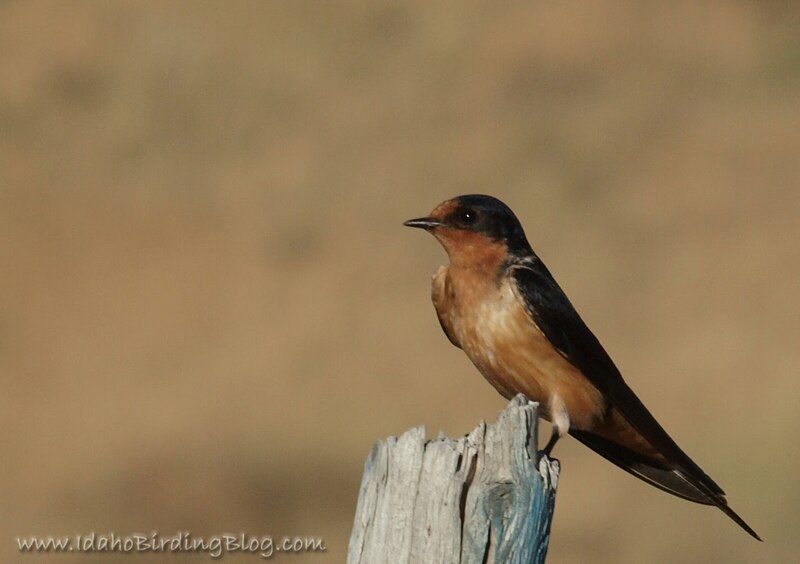 While I was taking an evening walk with my kids, a pair of Barn Swallows hunted flying insects nearby and posed for a few photos. 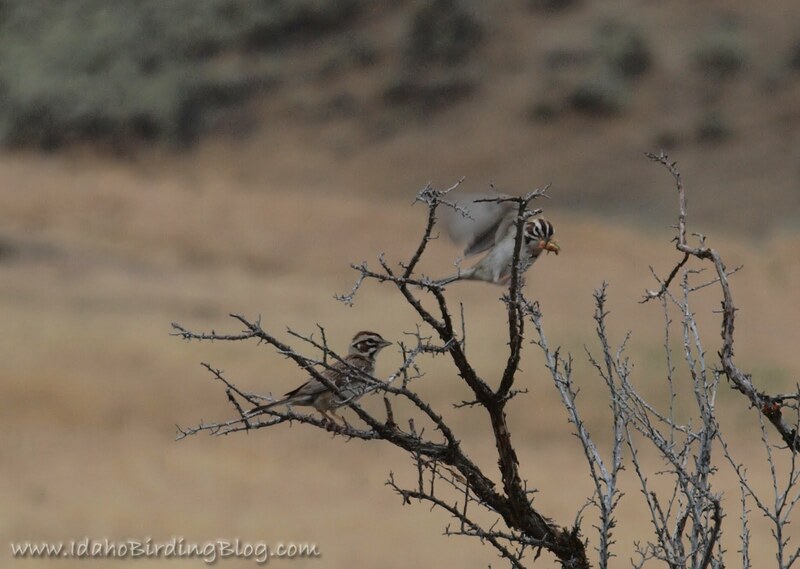 Lark Sparrows eating grasshoppers - Yay! 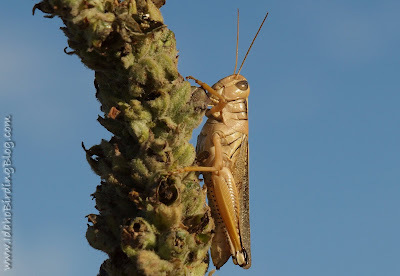 I watched as they scratched the grasshoppers against the brush, I assume to take off the strong and tough hind legs. Spotted Sandpiper without any spots. This is the non-breeding plumage. Check out this previous blog post for a comparison. Young Cedar Waxwing - this was the first time I have noticed them. They looked kind of funky-cool through my binoculars, but were too far for a great photo. At least you get the idea that they are different. This is a young American Robin whipping a caterpillar up in the air to eat it. It was fun to watch. It seemed to mash up the caterpiller on the branch, or at least rub off some of the spiny hairs. I wished the photo would have turned out better...it was such a cool looking tree snag and what was happening was really fascinating. - Poison Hemlock is a very invasive noxious weed that we battle each year in the riparian areas...we just need our neighbors up and down stream from us to battle them with our same vigor. Banded Garden Spider - I love these cool looking spiders, especially because they are catching loads of grasshoppers. 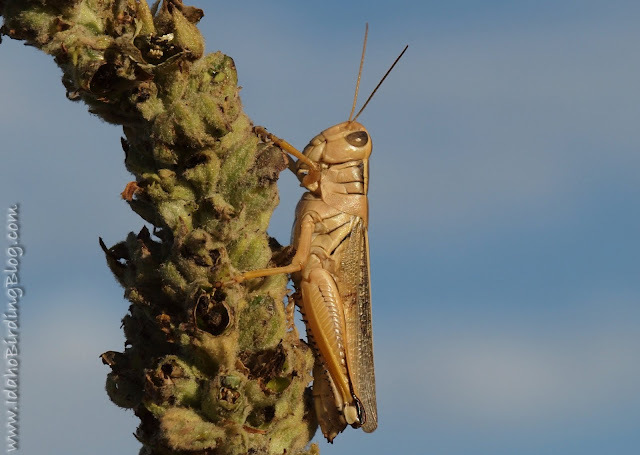 We are having the peak year in the seven-year grasshopper cycle. They have killed almost all my landscaping, even having devoured two of my three evergreen trees. I didn't even know they ate those! 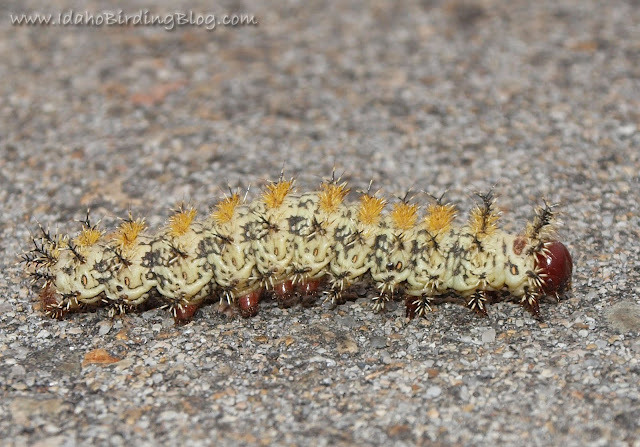 I'm not sure which moth or butterfly this caterpillar turns into, but it sure was freaky-cool! If you know what it is, please tell me! This image gives my wife the willies. 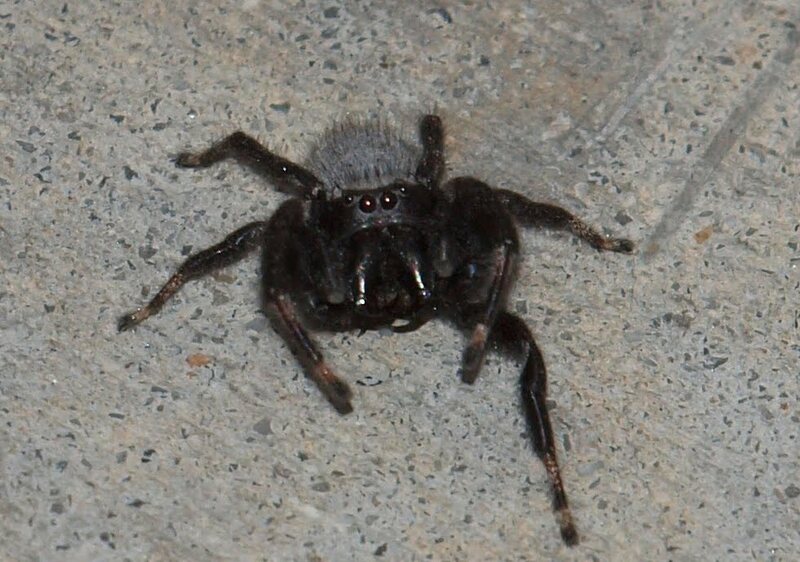 Again, I don't know what kind of spider it is and my searches in books and online have left me wondering still. It reminds me of Aragog, the giant creepy Harry Potter spider. This guy was only the size of a dime and so I used my macro settings for this close-up. What made it worse for my wife...while watching me edit these scary spider photos, we heard noises in the air supply vents in our ceiling. Turns out that a deer mouse had gotten into our air ducts and we could see it squirming around up there trying to get out. It was a long and dreadful night of little sleep as it made noises all night. I'm not sure that I want to inject poison into the air supply of the whole house and I am also afraid that mouse droppings/urine will infect us all with the hauntavirus. The air vent over our bed is still closed, and probably forever will be! 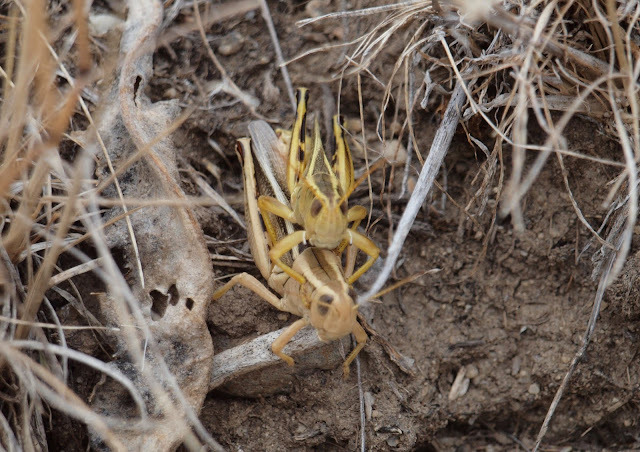 Here is a pair of those dang Two-stripped Grasshoppers, just making more of those plant-devastating pests. 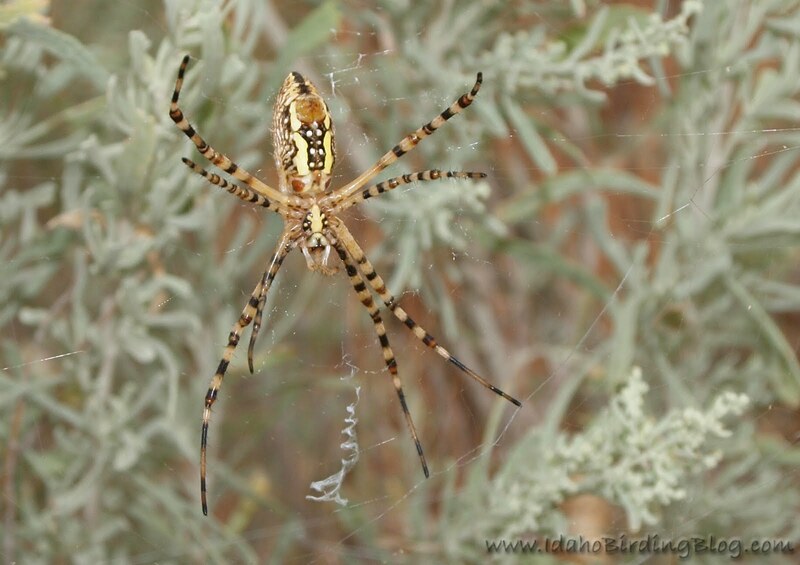 "I hope that Garden Spider or a bird eats the both of ya before ya have any more kids!" Western Yellow-jackets doing what they do best, making their paper mache nests in the least convenient to humans places as possible. This is on the stone ledge of the gazebo overlooking my neighborhood ponds. Several neighborhood kids have already been attacked by them. Small alpine lakes near Crimson Lake as seen looking down from the high mountain ridge. These lakes are on the opposite side of the ridge from Knapp Lakes where we had our base camp. See that blue lake with snow and ice still on it? I jumped in and quickly out of it...twice! This previously unnamed lake is now affectionately identified on Google Maps as Double-dip Lake. A spectacular waterfall runs from this lake down to Crimson Lake, which I dubbed "Reeve's Falls" for Mike Reeves who also took the polar bear plunge into Double-dip Lake. I'm one of the adult leaders for a group of Varsity Scouts based in Eagle, Idaho. Each year we plan an event called "High Adventure" with the goal of doing something challenging in the outdoors for a few days. This year in mid-July we did a backpacking trip to Knapp Lakes, a cluster of several alpine lakes about 20 miles west of Stanley, Idaho in the Challis National Forest. It required an eight-mile hike in, with several more miles of hiking to other area lakes. It was literally a "high" adventure. Jason Talbot, the president of our youngmen's group, gets all the credit for these photos. I left my camera at home. I'm a big enough guy as it is and couldn't convince myself to pack in the weight of my nice new camera and risk ruining it. View of the mountains from the trail. At this point we had to go cross-country as no official trails lead to Knapp Lakes. We just knew from the map that Knapp Lakes were somewhere out there in those trees at the base of those mountains. Below is the lake where we set up base camp at about 8000 feet above sea level. Spotted Sandpipers serenaded us from all around the lake's edge. 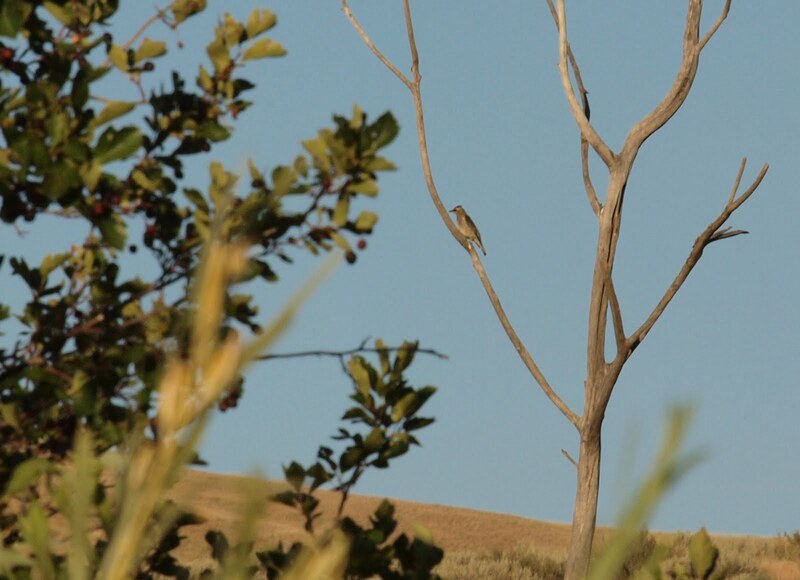 Olive-sided Flycatchers and Swainson's Thrushes joined the evening chorus. After a few hours on the trail, a few of us were reinvigorated by a plunge into the chilly waters (but significantly warmer than the lake I'd jump in the next day). An Osprey kept watch from an old pine snag. The fishing at this lake was a lot of fun for the guys. Rainbow Trout and Cut-bows (hybrids with Cuthroat) were caught in large numbers. We ate a lot of delicious fish each day. We awoke to a beautiful morning mist over the still waters. A Clark's Nutcracker called nearby. On the second day we summited the mountains above our camp "to see what we could see". Here is a view from the rocky ridge line overlooking some sister lakes. Traversing that rock on such a steep pitch was one of the scariest things I have ever done. Here's me on the ridge above Double-dip Lake with my trusty binoculars strapped to my chest at all times. Notice where the ice berg is? Now go back to the picture at the top of the post and see where it was when I swam in it. Kind of cool that we documented it moving around. It must have been about a meter thick and mostly below water. The view from Crimson Lake back at the ridge we had just come over. That was a hard climb; about 1000-1500 ft of altitude change. Here is a view from the top of the ridge down on those sister lakes pictured earlier. You can see a third lake in the back left. We climbed down through the trees here rather than risk life and limb on the rocky face again. Here's me...the caboose...along with X-man, Xavier Powell, hiking through a mountain meadow on the way back. We were the two biggest guys and therefore the slowest of the bunch. Though Jason easily is the best and fastest hiker in our group, he often hung back with us to see the birds with me. We called ourselves the "nature appreciation group". It was fun to unexpectedly run into fellow birders Rob and Karyn Miller as they tandem mountain biked into Knapp Lakes as part of their yearly tradition celebrating their anniversary. Jason Talbot, a birder as a kid, who by association with me is a born-again birder, also an avid hiker, and fly-fisherman. He has gained the reputation for taking scouts on rigorous character-building adventures known among us as "Talbot death marches". So, we saw some spectacular scenery that not too many have beheld in person. I got eaten alive by skeeters. There were some cool birds along the way too. Most importantly, I didn't die and only had some moderate soreness. I already can't wait for next year's High Adventure!